Pretty much all of us have a handbag glued to our arm or shoulder. I cant think of one of my girlfriends who leave the house without toting around half their life either. A good handbag is a day to day essential that doesnt have to be boring. Today I thought I'd write a little guide on how to pick a new handbag. Picking an everyday bag is no easy feat. Theres a lot of things you need to consider when deciding whats best for your day to day needs! Here are a few tips I picked up along the way! I’ve just purchased myself a brand new handbag in the form of the above & Other Stories beaut. A little multi functional black number with a geometric cut out. So chic, on trend and goes with pretty much every outfit combination imaginable. It also can be worn as a satchel or as a tote. Dream bag much? If you’re like me and seem to use the same bag religiously until you get a new one then pick something that goes with everything. Black and Brown are pretty standard when it comes to handbags but they do go with everything. TThen again things like metallics, leathers and white also go with any outfit. If black and brown arent your thing then here are lots of fresh and exciting alternatives worth exploring! Pattern and texture is also worth exploring, just keep in mind this is going to be your day to day bag, while their Cath Kitson bag is very cute, it's hardly appropraite for all situations! Small bags on tall girls will get lost and if you’re on the short side a smaller bag will make you look swamped. Make sure you pick a bag that’s relative to your own size rather than choosing a “on trend” bag. While big handbags are said to make you look slimmer, I think it’s best to choose something that compliments your size rather than exaggerates it. Bags come in loads of material these days including leather, synthetic leather and plastic. An everyday bag should be durable and something that can stand up to daily wear. For me leather is the best choice for a bag. It’s classic, durable and very chic. It’s easy to keep clean for the most part and waterproof if you spray it with a protector spray. Synthetic materials are also easy to keep clean but it’s worth keeping an eye out for ones that don’t have a “cheap, shiny” feel to them as they can look just that… cheap. I'm in love with this handbag! It's so different and so pretty! Versatility is the most important by far for me! I neeed to have a bag that goes with everything, which usually means its black! Great tips, your bag is awesome! I hate it when you pick a bag and end up having to hold stuff like your cardigan because it doesn't fit in your bag. I love this bag! It's really the right size. It's like you're reading my mind - I've been looking for "the" bag for such a long time. I'm so fussy though, and until I literally find the perfect one I'm not satisfied. I love the new bag! I totally agree, something that's durable and versatile. I love this post! Equally as much as your new bag, its gorgeous! Your bag is so beautiful! This post is super informative! Love it! I love bags but since I got my Cambridge Satchel I'm not sure I'd ever look back! It's perfect for everything. Great post, choosing the right bag for you is essential! a cool everyday handbag is essentiel! I always go for the biggest widest bags as I always carry SOOO much and I don't even know why!!!! I've never been to "And other stories" but always pass it, may just have to pop in now! Great tips and this bag is perfect, &other stories are always so on point with accessories! I've never been a bag girl, but this one looks so perfect :) great tips! Handbag shopping is so stressful, I go through so many bags because I'm never satisfied. Lovely helpful tips here. Everytime I see this coat I die a little inside! I love the coat you are wearing, the print is lovely! Agree with all these pointers; I have a bag from Urban Outfitters which cos £45 but the black durable material with a studded outline makes it easy to wear day and night, has compartments to keep everything organised, is a great shape and fits everything without looking bulky - a lifetime piece! Lily I love you... but please proofread your work!! Two mistakes alone in the size matters section! Great tips! A handbag should be an investment so it's important to pick the right one. 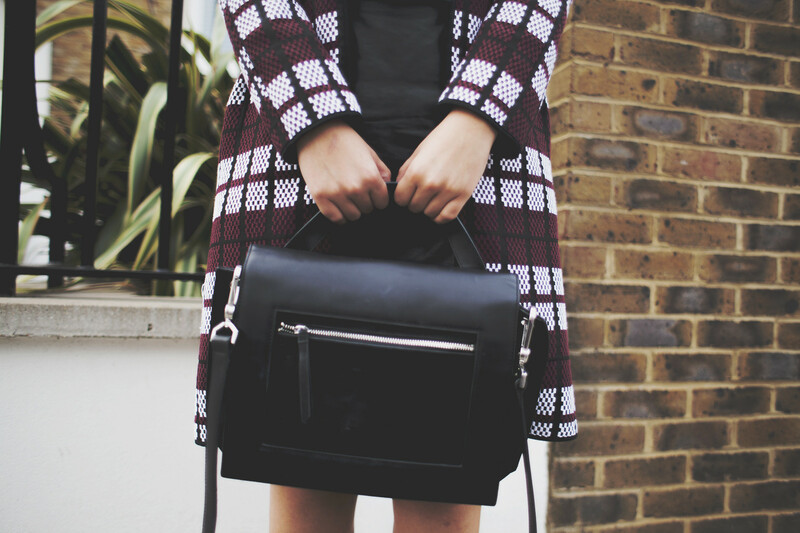 Great post, love bag and coat! I'm on the hunt for a new handbag so this post comes at the perfect time. Thanks for the tips, your new bag is so pretty! great post! really helpful :) and I love that bag! Ouu so pretty! My favorite bags are from London Fog, they are so under rated! That bag is amazing. Need one like that for sure. Your bag is so beautiful! This post is so informative! cute bag, and great post!! I saw this on your You Tube and I've loved it every since. Great guide! Handbags are so important! I am so in love with that bag. Nice tips! I'm on the hunt for a new bag right now! The bag on the picture is perfect, so simple and stylish. It is in the shape and size I like the most. Thanks for sharing your tips, they are really helpful! Fantastic bag, i love it! // LVAOT at www.lvaot.com // provides fantastic bohemian jewellery that would look perfect with this outfit! Beautiful bag, good advice too, I once tried on a Topshop backpack that made me look like a turtle. This bag is quote wonderful! It looked quite spacious as well when you showed a bit more of it on your channel recently. & Other Stories just seems to have one of the most interesting ranges, in terms of shape and design. I need to stop over stuffing my hand bags. That's why I can't buy cheap bag, I mean from somewhere like Primark. They just wouldn't hold considering all I need to carry on a day to day basis. great post and nice coat!